BLANCO’s thermal transfer label rolls have a smooth coated face stock which provides premium barcode printing. Smudge resistance has been optimized for a coated paper, but caution is recommended with contact scanners. These thermal transfer label rolls are ideal for printing variable data such as barcodes, shipping labels, carton content labels and product ID labels. BLANCO also manufactures a 1.25 in. x 1.25 in. 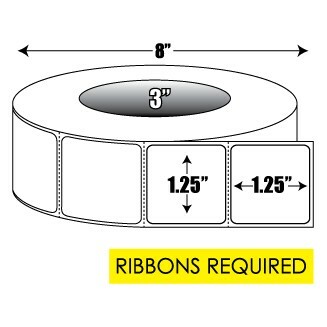 thermal transfer label with a 1 inch core (see related items).